04 JanIs This the Year for Your New Business? How many of you walked back into work today and had this burning desire to make a jump into that business you’ve been thinking about forever? You walk into your office (or cubicle) and try to get back to work knowing that your mind is really on your business idea. Right?! You aren’t the only one doing the exact same thing today. I was there. Many times. Many, many times. I often times get asked, “how did you know when you were ready to make the jump?” I enjoyed corporate life. I was blessed to work with creative thinkers who pushed me to see the world differently. 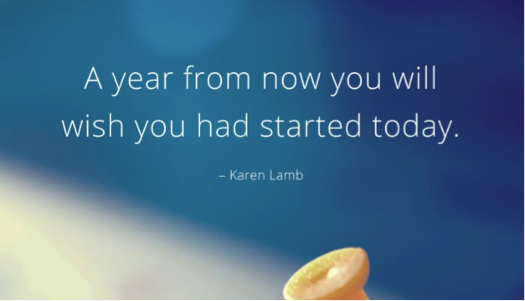 When did I know it was time to take the jump and become a small business owner? I attend the Global Leadership Summit each year and that year the message was all about change and not being afraid of change. The Monday after the Summit, I decided I needed one more day off. I knew I wanted to try something new, but I didn’t know if I had the courage to actually leave my corporate job. My sister told me to write my resignation letter and see what it felt like. If it felt scary …. I wasn’t ready to resign. If it felt a bit scary but exciting …. I was getting close to resigning. If I felt at peace with no doubts … I was ready. I typed my resignation letter that morning …. and I HIT THE SEND BUTTON! You may have a business idea or many business ideas in mind. I didn’t have a specific business in mind, but I knew what I didn’t want to do. That is a great place to start. Know where your passions are and know the things that you don’t want to do. It helps narrow the scope of possibilities. Talk to those people you trust the most. Tell them your idea and ask for their advice and honest feedback. Listen. They may not love your idea as much as you do. They don’t need to. You need to listen for hurdles you haven’t thought about and ideas that might be opportunities for your business. Be prepared. Gone is your monthly paycheck. Gone is the ability to call IT when your computer isn’t working. Gone are the paid vacation days. Gone are the paid sick days. Say “hello” to longer hours, being your own IT department, PB&J sandwiches in your office and days when you question your sanity! It is worth it if you go into it prepared and realistic. A realistic budget is a MUST for any small business owner. The first few months you might see yourself spending more than you are making and you will tell yourself “it’s okay, I’m in the start-up phase”. My philosophy, don’t spend more than the business is making unless you have a line of site to the return on that investment. Where will you work? Home office? Get it ready before you start. If you are working from home, consider creating an office space. It will be important to set office hours (it’s good for your family and friends to know these hours). Be in your office during those hours and you will see your business grow. Renting an office space? Consider the overhead and ask yourself if your business needs it. If you need a space, consider how much you need to get started and what expansion might look like in one or two years. Watch your overhead and grow into your ultimate dream. Kansas City (most cities) have many programs and groups available for small business owners. Join them! It’s a great way to meet new people, to learn from others doing the same thing and to get you out and about in the community. Your business won’t grow if you are stuck in your home office waiting for the phone to ring. Look for the groups that have business owners as members or as leaders/speakers. You want to be with people who have found success and not just the “dreamers”. Attend a meeting or a seminar and consider the membership. Is everyone in the “just starting out phase” of their business or are there members who have been running businesses for 3+ years who can offer valuable insight? Talking with people at the same phase is good for the soul, but talking to business owners who have been in the trenches will benefit your business. Today might be your day. Enjoy the journey you are about to start. Is today your day?